jaipur crafts brings back-flow incense burner that creates an illusion of a smokey waterfall. Material: ceramic package include: incense burner product dimension:3.1*2.5*4.7 Inches. Product weight:0.4Lb/6oz the backflow principle: because the density of smoke is heavier than the air density, smoke stream from the high down like a waterfall how to use choose a flat, windless place lit up the top of the backflow cone, burn it fully in case you have to lit it again place it on the incense burner, and wait a few minutes, the smog will slowly stream down, a dreamlike waterfall shows warm tips: after cones burned, it will leave yellow liquid and ash wash it with water, naturally dry would be great must be in a calm environment, the smoke will go back to the incense burner. Ceramic plate with a hole for an incense stick. The delicate design reflects the art of nature, suitable for the study, a bedroom, yoga. 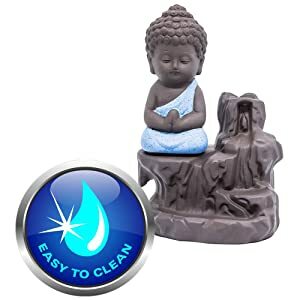 india handcrafted piece of work brings to you buddha insense burner. Each piece is handmade by craftsmen in jaipur region of india. These craftsmen bring generations of traditional art and creativity. The uniqueness and authenticity of each piece is reflected in small imperfections which are characteristic of handwork. back-flow cone incense burner creates an illusion of a smokey waterfall. 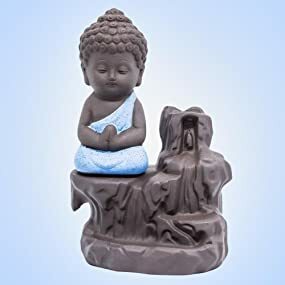 This piece of art has lord buddha sitting and meditating beside the waterfall. 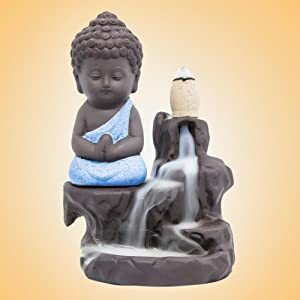 Simply place an incense cone at the top of the waterfall, and with the cone's special properties, the smoke starts to flow in reverse direction, that is from top to bottom, and in-turn creates a beautiful smokey waterfall. 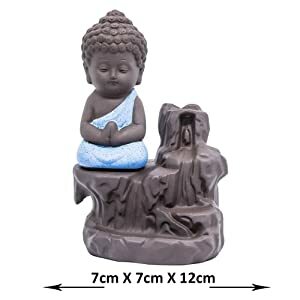 Decorate your home with this beautiul incense burner featuring meditating Lord Buddha which reflects the artistic brilliance and adds elegance to your decor. You can also place this brilliant piece of art in your pooja room as well. Style your home and office with this statue and put an incense stick into it to get admiration from your guests. It serves as a great gift, especially around religious celebrations and festivities. 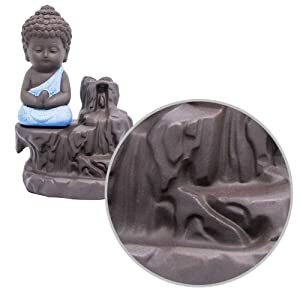 This is a great decorative piece as it can radiate the feeling of peace and calm around you. 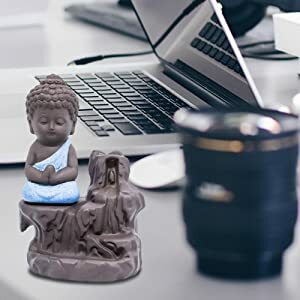 This meditating Buddha statue not only beautifies the surroundings, it also spreads peace and harmony in anyone's life. The showpiece/incense stand is ceramic made. Ceramic materials are resistant to heat and therefore you can easily put incense sticks it it without the fear of damaging the item. 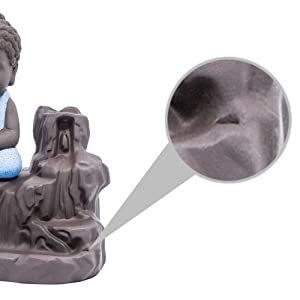 The item has holes for putting the incense sticks inside. When the sticks are put inside the beauty of the piece increases as a smoke fountain is formed and this enhances the beauty. The incense burner has back-flow design that creates an illusion of a smokey waterfall. Place an incense cone at the top of the waterfall. The cone has special properties with the help of which the smoke starts to flow in reverse direction, that is from top to bottom, and in-turn creates a beautiful smokey waterfall. The showpiece has dimensions of 7cm X 7cm X 12cm. Hence its size is ideal for putting inside the home temples and even as a decoative item on officetable, shelves or living room centre table. The item can be gently washed for removing dirt. You can also clean it with soft dry cloth for removing dust and particles.